My last “English only post” was quite a long time ago, so I decided to write this one here. Not only for my English page visitors but also because the topic/product I want to share with you is currently only available in this language and it saves a lot of translation work. Of course there is some kind of SEO aspect about it, but anyway. 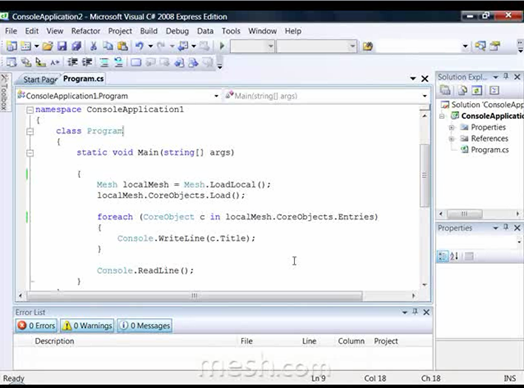 Back in spring I heard the first time on Twit of mesh.com as a synchronizing Tool for data and files, but at this moment it was still in early beta and a website wasn’t set up in the past. So it slowly faded out of my mind until it was mentioned in the last Twit episode, that made me interested in mesh a 2nd time. Unfortunately the service isn’t available yet, but instead some demo videos and I also signed up to the waiting list. From what I’ve seen so far look pretty what I had in mind, and it seams like mesh meets my expectations of tiny cloud service. Currently mesh is only capable of synchronise files, not data like calendars or emails but Microsoft is planing to extent the service, according to their ad. The Service is also only for Vista and XP; OSX and Windows Mobile support will be added later. I guess Linux support is beyond question, so I still need my FTP solution in this case. What really suprises me are the benefits , mesh supports almost all programming languages across the board und multiple accessing possibilities. I hope I get chance to try mesh out for myself really soon. 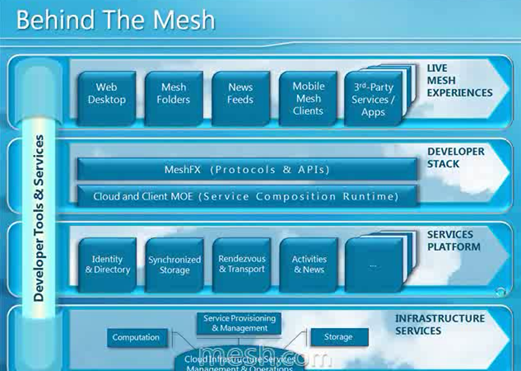 Live Mesh puts me in the center of my digital world, but seriously I haven’t noticed yet being in the edge of my digital world. What a stupid slogan! Quite powerful opportunities for developers. Writing code becomes fun once again! wolken ordenadoring. Uno el brekindance, Dos el cruzaito, Tres el Maquelason, Quatro Robot.